“I’ve lived in Cumberland my whole life. Spending three months living in downtown Washington, D.C. – even aside from the internship – was just indescribable,” said Riggs. Unlike many other D.C. internships that tend to focus more on basic administrative tasks, Riggs’ daily activities were more like those of any other staff member employed in the senator’s office, including policy work, briefing hearings and committee hearings. Riggs’ internship was sponsored through FSU’s Beall Institute for Public Affairs. Created through gifts to the FSU Foundation from the late U.S. Sen. J. Glenn Beall Jr., his family and others, the Beall Institute strives to inspire and prepare Frostburg State students for active participation and leadership roles in public affairs. “What we really want to do here at the Beall Institute is to get students interested in public affairs, the topics that exist in the world around them, and also to potentially help them get a job in public service,” said Tim Magrath, lecturer in Political Science at FSU and Executive Director of the Beall Institute. Sponsoring internships in Washington, D.C., and in Annapolis is just one of the ways the Beall Institute achieves that goal. In addition to matching students to internship positions, the Beall Institute provides financial assistance to cover housing and transportation costs, making these internship opportunities more accessible to a greater student population. An International Studies graduate, Rigg is grateful for his coursework at Frostburg State and acknowledges how practical it was to get his degree here. “FSU really prepared me in my classes. I was able to wrap my mind around all the variables that go into something when it came down to a vote on a bill or just how all the puzzle pieces interact. It just made it more digestible and less overwhelming once I was on the job,” explained Riggs. As for other students who might be thinking about doing an internship through the Beall Institute, Riggs has some advice. “This is a great opportunity no matter what career you’re thinking about, not just politics. You meet so many people in and out of politics which creates a network to help you kickstart your career. At a bare minimum, you have something meaningful for your resume, but I guarantee you’ll get a whole lot more than just that,” he said. For more information about the Beall Institute or to apply for an internship, visit www.frostburg.edu/beall-institute. To support the Beall Institute through the FSU Foundation, call 301-687-4068 or visit www.frostburg.edu/foundation. 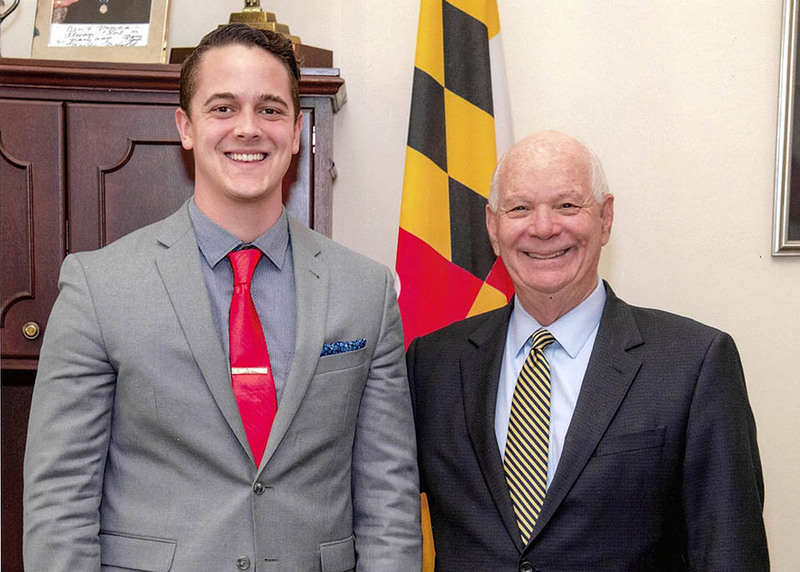 2018 Frostburg graduate Joshua Riggs, left, interned for U.S. Sen. Benjamin Cardin, right, last fall.